A RUP LIFE: Smurfs: Smurfs to the Rescue! On DVD! Smurfs: Smurfs to the Rescue! On DVD! ARupLife received a copy of this title for review purposes. Ok I love Smurfs! I have a whole collection of little resin ones from when I was little (in the attic in my Miss Piggy lunch box!) I bring them out for different holidays. So to say I was excited about this DVD might just be an understatement. I don't watch all that my big kids do anymore - just not enough time. I did sit down for this one. Featuring classic episodes it was my childhood on screen!!! Get set for “super-Smurfy” fun this summer! Warner Bros. Home Entertainment (WBHE) is set to release The Smurfs: Smurfs to the Rescue! on DVD July 16, 2013. 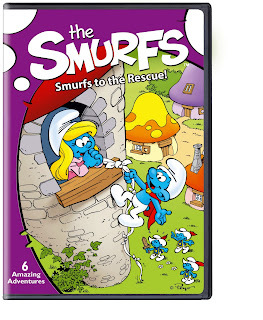 Join Smurf favorites Papa Smurf, Smurfette, Jokey, Handy, Clumsy, Dreamy and others in a delightful set of six entertaining adventures from the classic Saturday morning cartoon series. The Smurfs: Smurfs to the Rescue! will retail for $14.97 SRP. Get ready for some “Smurf-tastic” adventures in this entertaining collection of six animated cartoons from the hit TV series The Smurfs! They may be itty-bitty and blue, but the Smurfs are enormously brave when someone’s in trouble. Follow Papa, Brainy, Smurfette, Vanity, Lazy and friends as they escape from being the star attraction in Sideshow Smurf, rescue a visitor from outer space in It Came from Outer Smurf, or look out for one another when a volcano threatens the village in The Sky Is Smurfing! The Sky is Smurfing! It all adds up to an “abso-Smurfy-ly” good time when the Smurfs share one of their most treasured traits – courage! Kids and adults will be entertained with this not-to-be-missed collection featuring six “Smurf-tacular” episodes, totaling over 90 minutes of “Smurf-sational” fun! The Smurfs are a group of over 100 bluish, three-apple tall creatures who live in the mushroom homes of Smurf Village. They are led by 543-year-old Papa Smurf (who doesn’t look a day over 530). Their lives would be perfect were it not for their villainous Gargamel, a wizard who spends his days trying to capture them to eat, turn into gold, or for other evil reasons. Gargamel’s cat Azrael adds to the menace, always looking for a tasty, Smurfy snack. Produced by Hanna-Barbera Productions, The Smurfs originally premiered as part of NBC’s Saturday morning programming lineup. The Emmy® nominated series ran for nine seasons on NBC earning a 42% share of the U.S. Saturday morning audience. You can find this DVD at your local retailer or online at Amazon!